It’s hard to believe it’s been six years since I saw the exhibit “Van Gogh Up Close” and came home with a head full of ideas—and that evening sketched Giuseppe and Mr. Sunshine on the landing for my first “Cats After van Gogh” sketch, a theme and style that’s stayed with me for over a dozen other sketches and created a new style for my art. I’m celebrating the original sketch today, and I’m offering a discount through April 30, 2018. Use the code “VANGOGH5TH” to get a 25% discount on all the things I’ve made with this image. Many items are shared below and others are still in production. 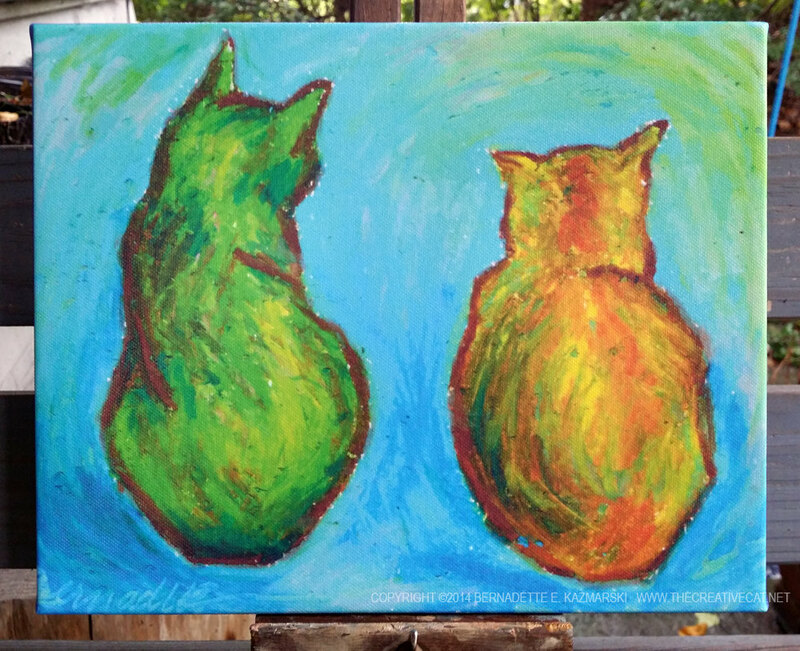 Two Cats After van Gogh, 8 x 10 canvas. 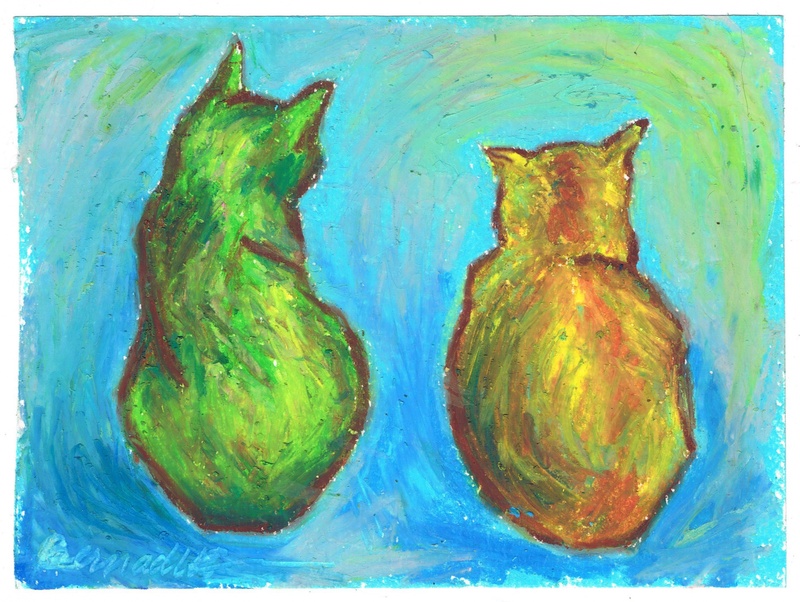 This art is “Two Cats After van Gogh”, 5″ x 6″ oil pastel on textured paper, © Bernadette E. Kazmarski, signed and dated 4/12/12. 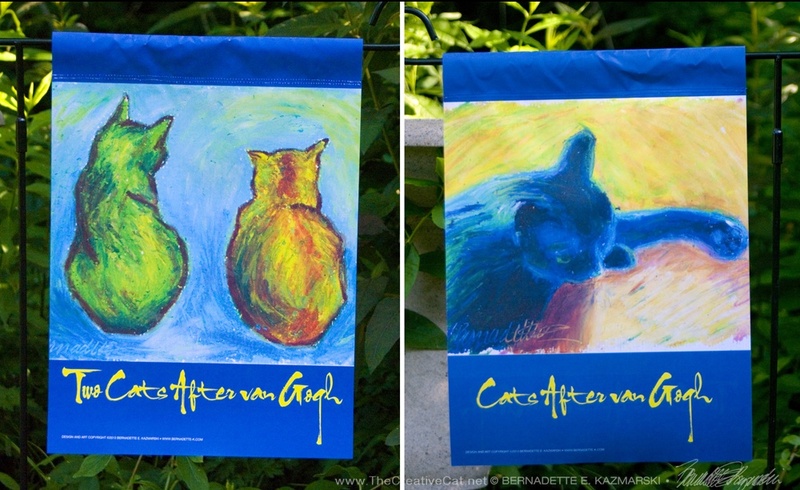 The original is sold but prints are made in archival inks on Epson Cold Press Watercolor Paper, Hot Press Digital Giclee Paper or Artist Canvas, and the design is also available as a garden flag and as a keepsake box. Note that prints are not the same dimensions as the original and may be cropped on the top or sides to fit the dimensions of the print size. I usually have at least one of the smaller sizes of canvases on hand, but order larger ones as they are ordered here because customers often want a custom size. Smaller canvases are a 3/4″ in depth, Canvases 12 x 16 and larger are 1-1/2″ in depth. I set them up so the image runs from edge to edge, then the sides are black or white or sometimes I slip in a color that coordinates with the painting. This canvas is white on the sides. All framing is done by me in my studio. This print is matted with a double mat 1.5″ wide, white on top with a rust underneath to match the outline of the two cats. The frame is a molded 1.25″ natural white flat painted wood. The backing is acid-free foam core and the glass is premium clear glass. On this piece, the frame and mats may vary slightly since both the mat and frame are on the list to be discontinued, though that may take more than a year. 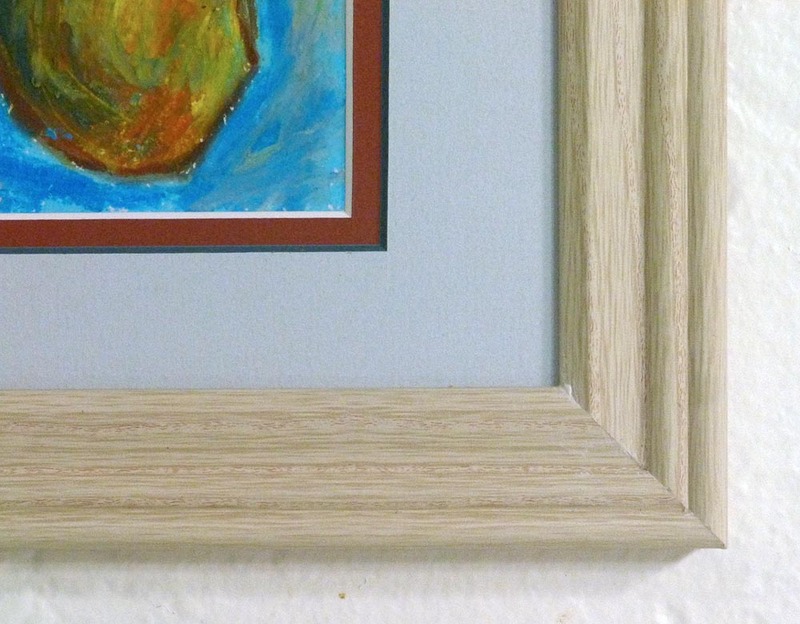 The framed pieces will definitely resemble the one shown here. 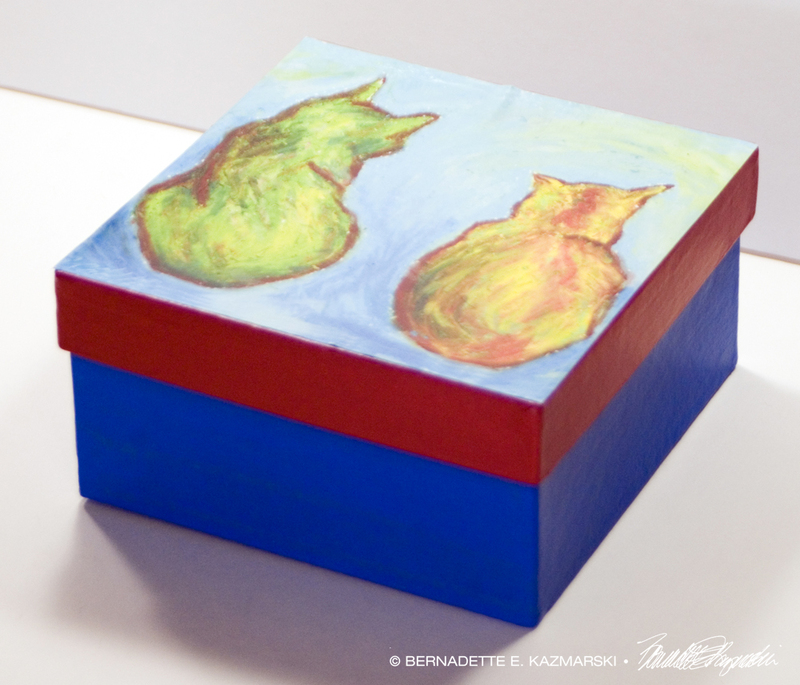 This papier-mâché box is hand-painted in indigo with bright red trim, with a print of “Two Cats After van Gogh” decoupaged to the lid. Lid and bottom are finished with matte-finish polyurethane. Box measures 6″x6″ in diameter x 3″ high. Price includes shipping. I choose colors that coordinate with the artwork and paint each box, in this case the red and blue being liberally used in each of the paintings. 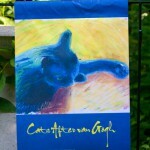 I then print my artwork on acid-free matte-finish paper with archival waterproof inks and adhere the print to the lid. I finish the bottom and lid of the box with water-based clear varnish. Box insides are unfinished. 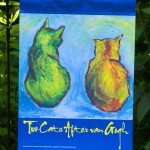 Visit “Anniversary Sketch: Two Cats After van Gogh” to read more and see a slideshow of over a dozen more works in this style. 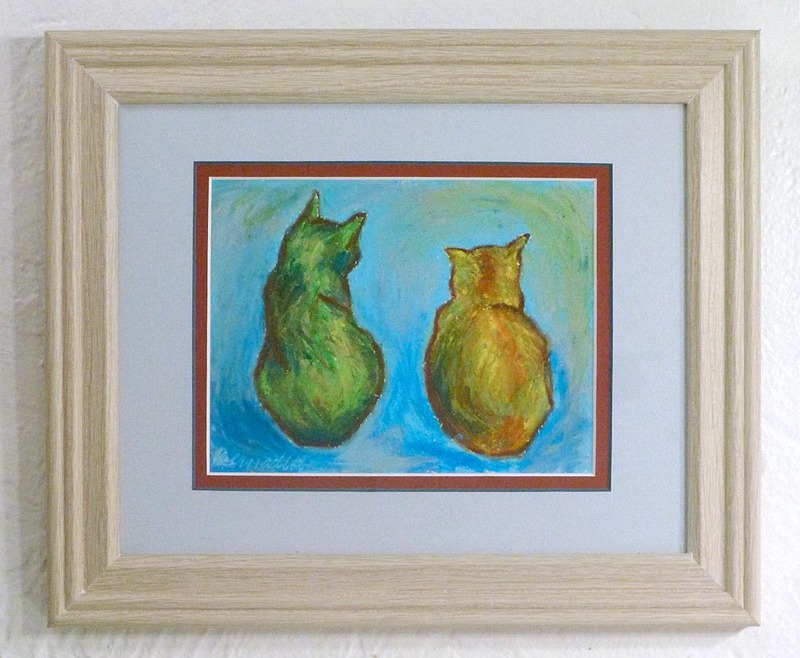 See other gift items made from my artwork in my gallery of Gifts Produced from My Designs. 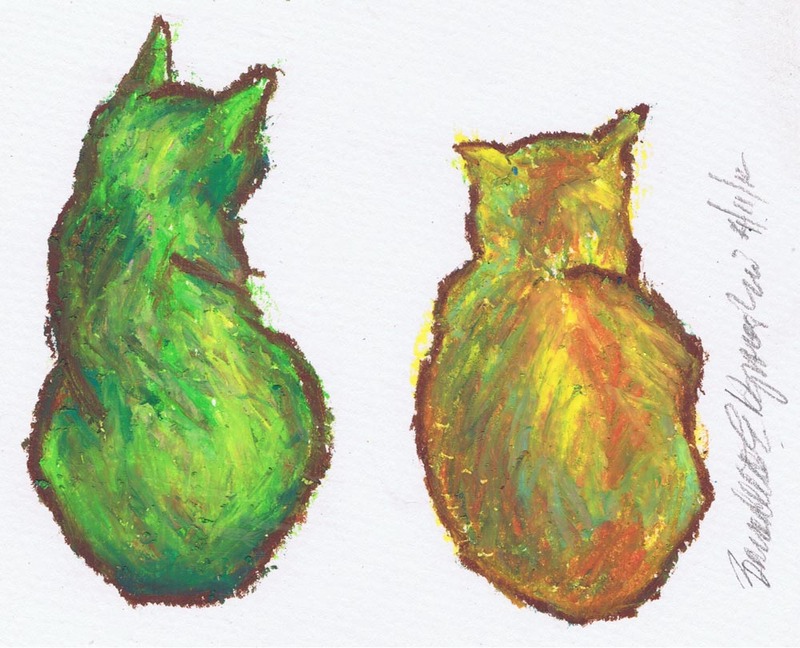 This entry was posted in black cats, cat artwork, Feline Gifts Produced from My Designs, Gift Items, Handmade Feline Gift Items, Handmade Gift Items, oil pastel on April 12, 2018 by Bernadette.